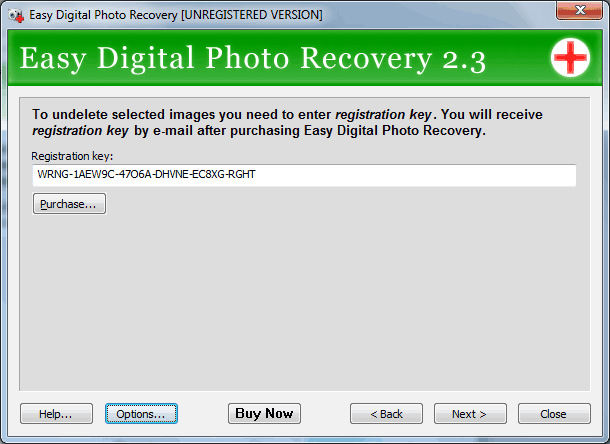 Why Should I Register Easy Digital Photo Recovery? Easy Digital Photo Recovery has the demo version. This means that you can also view deleted images in the program window, but if you decide to save them to disk, then you should register your copy of the program with us. free upgrade to any minor version 2.x. How to register Easy Digital Photo Recovery? After you pay for the license, we will send you to your e-mail address the registration key you will have to enter in the registration page. Copy the registration key received by e-mail to the clipboard. Paste the registration key from the clipboard into the registration page and click “Next” button.